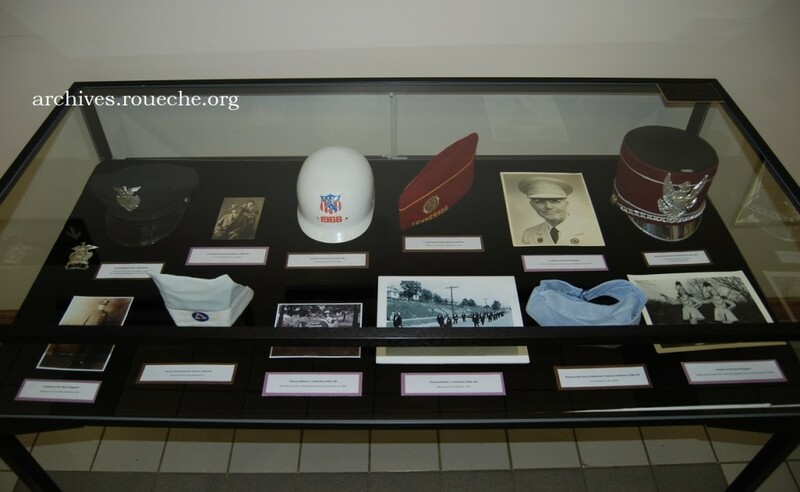 There’s a new archival exhibit at the Kingsport Public Library and it honors the many roles filled by Kingsport residents over the last century; roles of volunteerism, leadership, mentoring, and service. 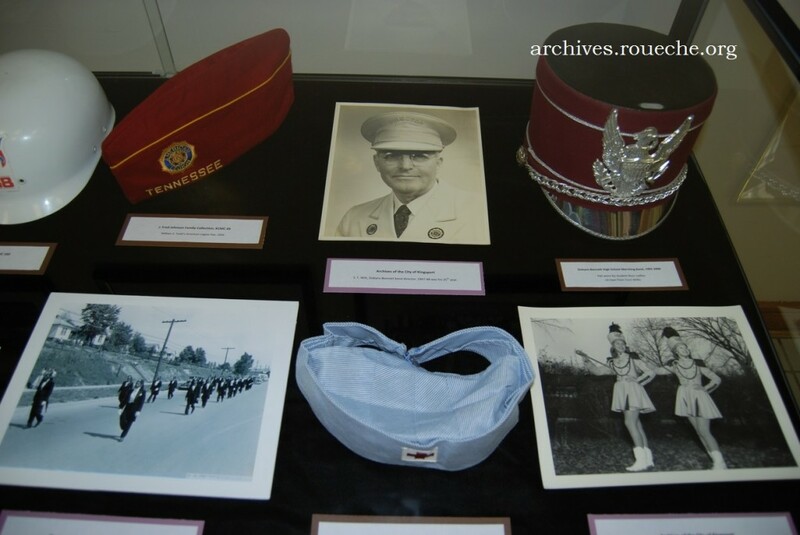 “Throw Your Hat Into The Ring, Kingsport!” will be displayed on the main floor of the library through the end of November 2014. 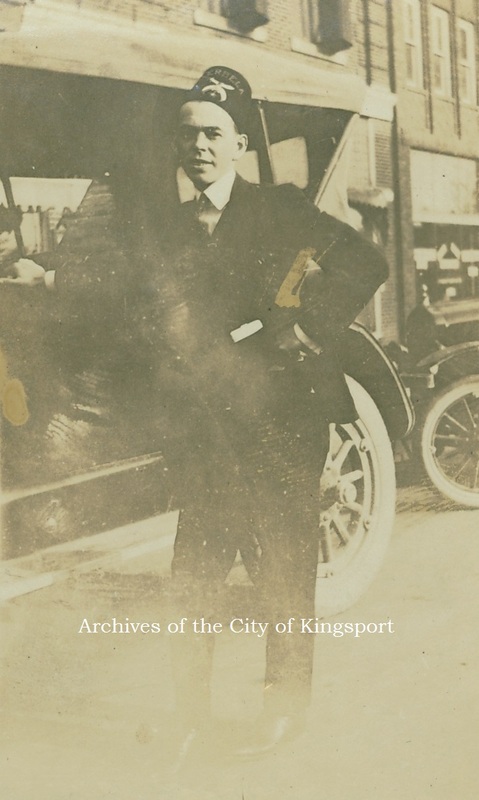 Speaking of dedicated Kingsporters, this blog post is dedicated to Jeff Fleming, the city manager. 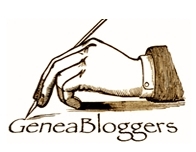 No one loves Kingsport more than Jeff and no one has been a bigger supporter of this blog than Jeff, who re-posts my entries to his own blog every month! Thanks, Jeff. There were many challenges to curating this exhibit and some of them are worth talking about, here. One challenge was created by the cases themselves. We could not display hats that were taller in height than the actual case. Another limitation was created by the contents of our collections. I wanted more hats for women and children and I was able to make up the imbalance somewhat with photographs. Since all of the Kingsport Archives collections have been donated, not all groups are represented. There were a few groups I wanted to include that we had no collections for at all, let alone hats, and that’s when I got the idea to reach out to a few organizations in town. 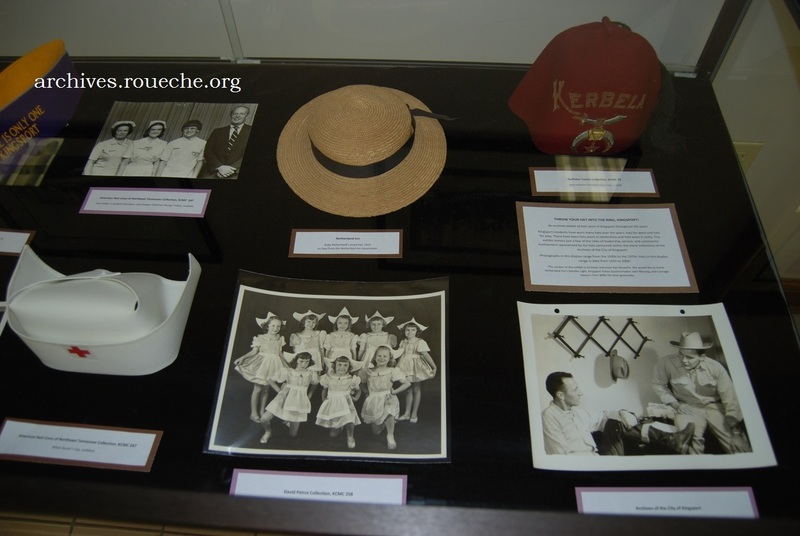 The right exhibit case features the oldest hat on display, a 1910 child’s straw hat once belonging to Ruby Netherland. The Netherland Inn Association allowed me to comb through two large boxes of vintage hats from their collection and select something really special for the exhibit. What a wonderful experience it was to stand in one of the log cabins on sight with committee member Jennifer Light, the morning sun streaming through the window illuminating the historic contents of the archival boxes, knowing I could choose any hat I liked. From the Joe Higgins Santa Train Collection, KCMC 156. Also included in the right case, I hope people realize how special it is that we have the original costume from the very first Santa Train Santa Claus. It was made by Mr. Higgins’ wife, Clara, in 1943. 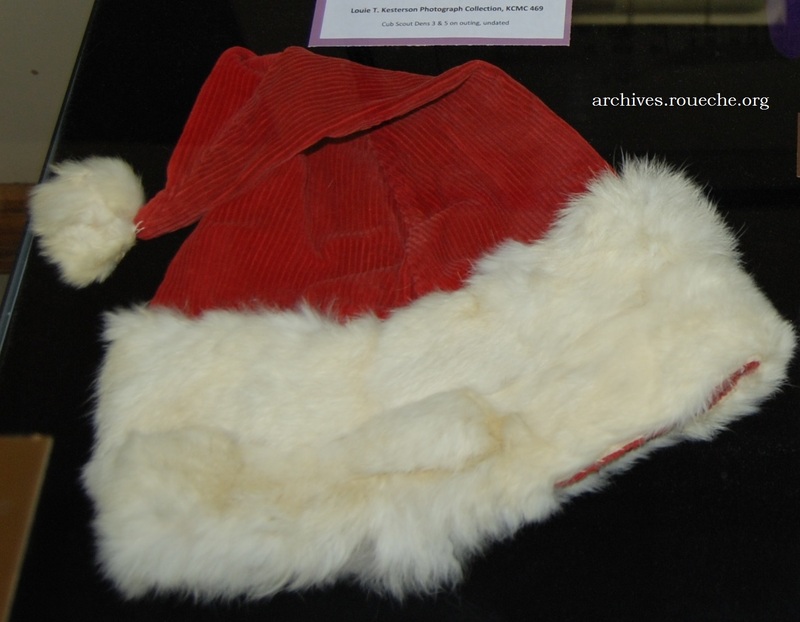 A close-up of the right case focuses on a nurse’s cap from the archives’ extensive Red Cross collection and a fez from the Huffaker Family Collection, KCMC 75. The Shriner fez is what initially inspired the exhibit. The Huffaker Collection is one of the first I ever worked on when I was still a student. The Huffaker Collection even contains an original photograph of Jack Huffaker wearing the hat. Items in the left case feature Tommy Mottern’s 1968 soap box derby helmet and Maurine Hattaway’s nursing cap from World War II. For well over 20 years, soap box derby racing was a big event in Kingsport. Come to the archives on your next field trip and see two actual racing cars in the archives lobby! 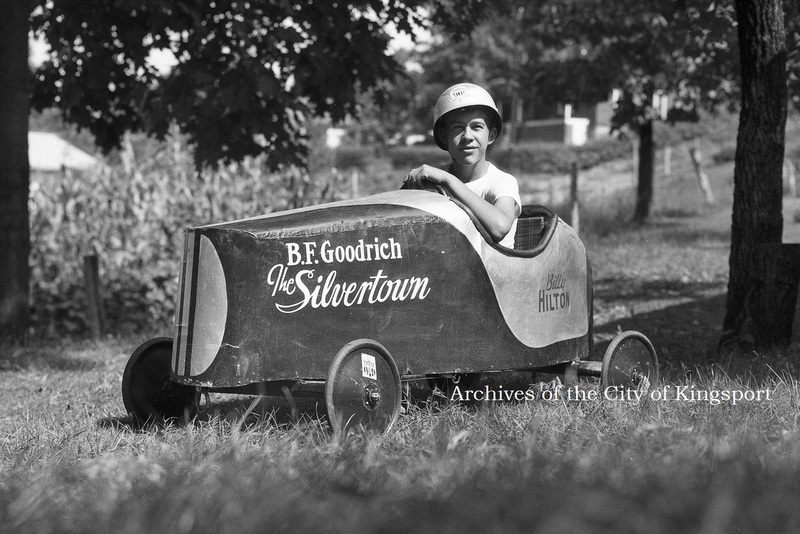 Billy Hilton in his 1946 soap box derby car. A close-up of the left case puts a spotlight on my favorite photograph, that of majorettes Margaret Catron and Jackie Simmons, 1946-47. Lastly, I want to share with readers the most rewarding part of this exhibit; working with Kingsport Police Department Quartermaster Sgt. John Blessing. After cold-calling the Police Department and maneuvering through a maze of phone menus, I was finally connected to the office of the Quartermaster. Following a day or two of phone tag, Sgt. Blessing agreed to set out on a quest to find some vintage items for the display while I decided upon just the right photo to accompany them. When we met this week, Sgt. Blessing escorted me back to a hallway with photographs dating from the 1920s forward. Together we were able to pinpoint the exact era for the cap and for the extra hat badge (1940s) that he’d located. The photograph was another story. We knew it was old but with no name or date, we had to step in front of each photograph and make comparisons between the uniform cut and the hat shape until we stopped at a grouping from 1925. Eight officers were in a line, two on motorcycles and the chief standing in the center. At the bottom, there was a dated caption with all of the names typed out. Score! Sgt. Blessing, with his detective’s eye, found the actual officer from my photograph. 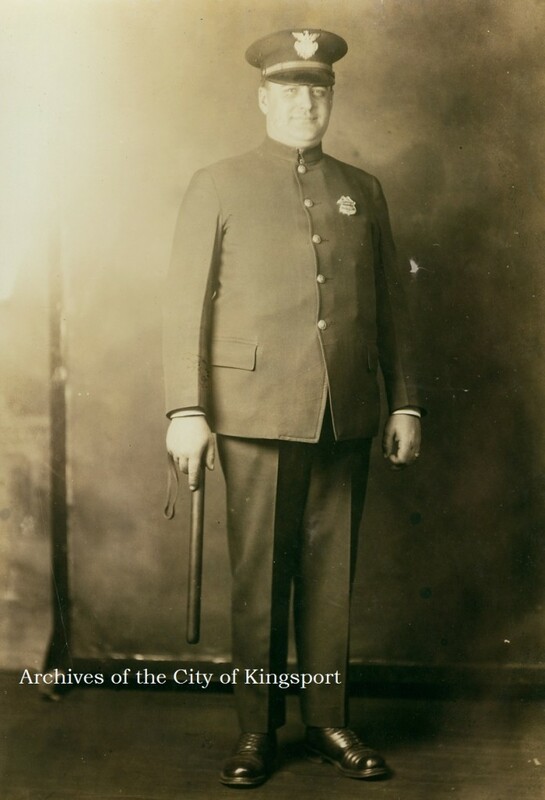 Kingsport Police Officer Joe Marrs, 1925. What a moment. I loved holding the hat and badge in my hands and imagining the places their past owners had been, the excuses they had to listen to, and the stories they could surely tell. When we were finished, Sgt. Blessing escorted me to the front doors and I wondered if anyone had ever left a police station before with such a big smile on her face! I hope you will stop by the exhibit the next time you are at the library checking out books. Or, make it a special outing with ice cream afterwards. The library is open until 8:00 pm Mondays-Wednesdays and until 5:30 Thursday-Saturdays. Feature image: Cub Scout dens 3 & 5, undated. Kesterson Photograph Collection, KCMC 469. This entry was posted in Kingsport and tagged ephemera, exhibit, hats, Kingsport, photograph, police, Women. Bookmark the permalink. This is a great display. My favorite so far. Karen, you have to like all the exhibits. Especially when they are your idea! This exhibit is so interesting! 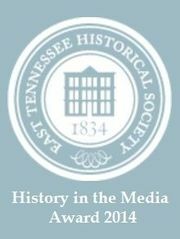 It is a creative way to tell the stories of Kingsport and the roles played through the lens of the caps. I am looking forward to a trip to the library to visit the exhibit. Thanks, Charlotte. I hope you enjoy it. I’ve been looking forward to this post! I am not disappointed! I guess I hadn’t realized how much archival work IS detective work at times. You obviously have a new friend in Sgt. Blessing. I was also glad to see the marching band hat (shako is the hat style name and what we called them in our marching band) and of course the banner picture of the cub scouts in their classic hats. The baseball style hats scouts wear these days just aren’t as cool! Bringing up the soap box derby historical feature was a really nice touch and something that some of your residents will likely remember. Ah, yes. Shako. The term is coming back to me. Good observation on the change in Scout hats. I agree with you about the older ones. On my way home from the police station, I passed through a speed trap in my neighborhood. Without thinking, I smiled and waved at the officers holding the radar guns. They probably thought I was nuts! 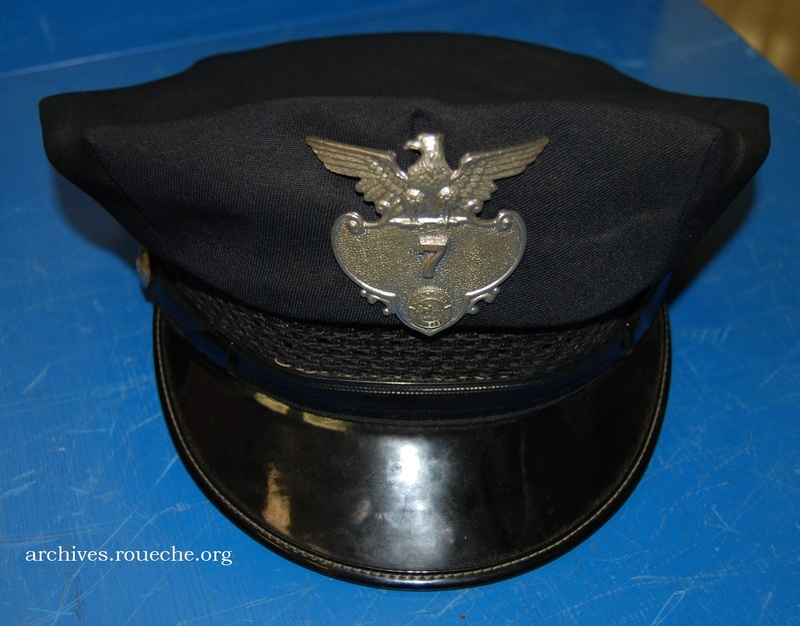 But, with the hat and badge in the seat next to me, I had only good will at that moment for the men in blue!